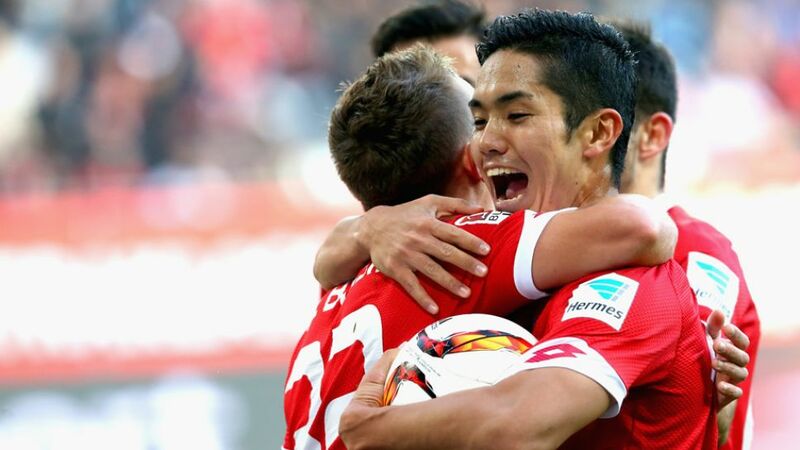 Yoshinori Muto scored his first Bundesliga hat-trick as 1. FSV Mainz 05 salvaged a 3-3 draw at FC Augsburg, who had come from 2-0 down to lead 3-2, in second-half stoppage time. The hosts, who went into the game propping up the Bundesliga table, were unlucky not to take a third-minute lead when Markus Feulner rattled the crossbar with a thunderous 20-yard-effort. It was not long before Mainz took control of proceedings, though, and when Pablo De Blasis picked out an unmarked Muto on the edge of the six-yard area, the Japanese international was left with an easy finish to put Martin Schmidt’s side 1-0 ahead. The summer signing doubled his personal tally with another close-range finish on the half-hour mark, but Paul Verhaegh’s expertly-taken penalty three minutes before the interval gave Augsburg hope. Buoyed by Verhaegh’s goal, Markus Weinzierl’s side flew out of the traps at the beginning of the second half and restored parity five minutes after the interval when South Korea international Ja-Cheol Koo nodded Caiuby’s cross past Marwin Hitz at the far post. Raul Bobadilla appeared to have completed a miraculous comeback when he slotted past Karius with ten minutes remaining, but Muto bundled home his third with the last kick of the match to earn the visitors a share of the spoils from a breathless encounter. Yunus Malli has been in sparkling form for Mainz this season, but the 23-year-old was outshone by his striking partner at the WWK Arena on Matchday 11. Muto’s treble - his first away goals in a Mainz shirt - makes him the first Japanese player in Bundesliga history to score six league goals in his first 11 appearances. His side were denied victory with the last kick of the match on Saturday, but these are the games Markus Weinzierl will feel his side have to win if Die Fuggerstädter are to claw their way out of trouble. FCA are now without a win in six in the league, with two crucial matches against fellow strugglers SV Werder Bremen and VfB Stuttgart coming up in the next fortnight. Muto is the fourth Mainz player to have scored a hat-trick in the Bundesliga.Verhaegh has converted all four of his penalties so far this season.The Dutchman’s spot-kick was the fifth Mainz have conceded this season, but the first to have beaten Loris Karius in the Mainz goal.